Lisa Jewell is a hit or miss author for me. I loved Then She was Gone, but I hated The Third Wife. Her newest book was released right before the new year and is called Watching You. I read Watching You over a month ago, but I am just now getting to the review. Fortunately, I still remember the basic plot lines. Like the rest of Jewell's novels, this is a suspenseful thriller with female protagonists. Also, like her other novels, this one has a few twists. This book is about a small upper-class community and its inhabitants. In particular, it focuses on a grown woman but doesn't act it named Joey who is married but doesn't act it. She is infatuated with one of the neighbors - the head teacher of a nearby school. However, she is not the only person who is into the teacher. Some of his students seem to also find him attractive. Except for a student named Jenna and her mother who believes he is stalking her. This teacher, Mr. Fitzwilliam also has a son who seems to be obsessed with the neighbors and takes pictures of them without their knowledge. But, it wouldn't be a Lisa Jewell novel if someone didn't end up dead. And someone does. And it was easy to guess who did it. Overall, it was not my favorite, but it may be that I am have been oversaturated my this genre. 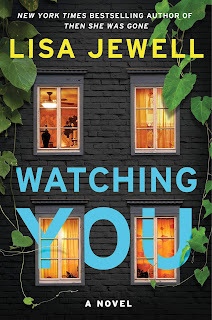 If you are new to Lisa Jewell, and especially if you are new to this genre, then you will probably think it is great. Thanks to Netgalley for providing me with a copy to read and review!